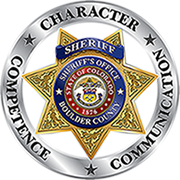 The Boulder County Sheriff’s Office is currently recruiting volunteer facilitators who want to make a difference and believe that people can change; work in the Jail’s Victim Impact classes and help inmates learn to recognize the impact of their behavior on others. Be part of a program that makes a difference. The program has been ongoing for the past 9 years and has been recognized for numerous awards. Taking volunteer applications until January 30, 2019, Victim Impact Facilitator Training will be in February. Facilitators must both understand victim impact issues and believe offenders can change. If either of these concepts is missing, the class will be less effective. The facilitator needs to understand most offenders have experienced some kind of victimization in their past which set them on a negative path in life. However, at the same time, they must be clear that past history is never an excuse to victimize others. Although the inmate was a victim of some kind of trauma in the past, they are in prison because they became victimizers. The facilitators should also be able to manage discussion and present opposing viewpoints. Facilitators must be open and inviting yet able to establish firm boundaries and respectfully confront denials, minimizations, justification, and able to read class dynamics. The goal is to establish a rich learning environment that incorporates relevant curriculum materials, adult-centered learning principles, experiential learning opportunities, cultural sensitivity, and activities to facilitate changes in offenders’ thinking, feeling, and behavior. Prepare thoroughly for all sessions. All volunteers are asked to commit to joining the team for at least one year, and attend bi-monthly meetings for 1.5 hours to debrief, review new policies, and in-service training. If you are interested in volunteering for the above positions, please fill out the Volunteer Application Form and submit to Restorative Justice Department of the Boulder County Sheriff’s Office.